Method A uses straight through trunks where position 1 arrives at position 1. Method A is perfect for installations requiring simplex circuits as no natural pair flip is obtained in the trunk or the cassette. 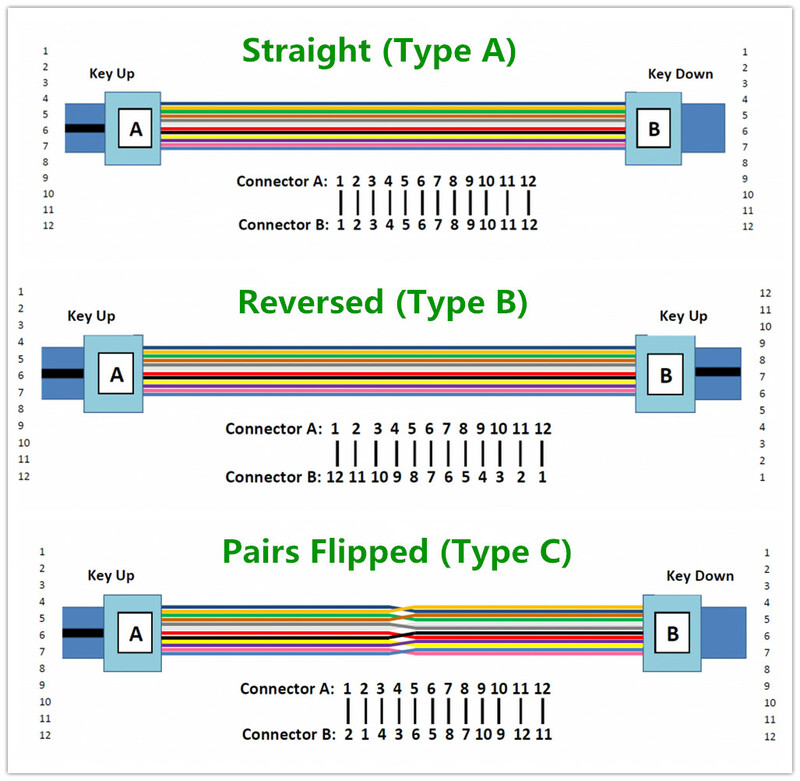 However, when used for Duplex applications, Method A requires management of patch leads to obtain the required pair flip to allow for duplex communications. Often Method A is seen in Telecommunications companies carrying forward Simplex patching from legacy systems. Note that Method A is not naturally suitable for parallel optics (40G) which require a 1-12 ribbon flip cable. Method B uses an end or ribbon flipped trunk where position 1 arrives at position 12. Method B traditionally required different cassettes when used in a duplex fashion, but advances in wiring methods have eliminated that requirement and can offer a natural pair cross when paired with B4/40G/SR4 wired cassettes or fanouts. Method B trunks can be utilized for both duplex circuits and parallel optics (40G) naturally with no cassette or patch lead management and offers a natural upgrade path from duplex 10G to parallel 40G circuits. These trunks are now becoming the standard in many data centres and telecommunications companies. Method C uses trunks with a natural pair cross where position 1 arrives at position 2. Method C is suitable for duplex circuits, as no cassette management or patch lead management is required. This method is seen in many data centres running bulk 10G ethernet connectivity. But it is not naturally suitable for parallel optics (40G) which require a 1-12 ribbon flip cable and is being superseded by Method B in many applications. For more information on MTP methods and understanding polarity, contact us here, we’d be happy to help.